Microsoft’s Skype Team is about to unveil the update to version 5.0 of the popular voice and instant messaging app for iOS. The upgrade involves a major facelift of the Skype App which will be it its biggest bump ever in the iOS platform's history. 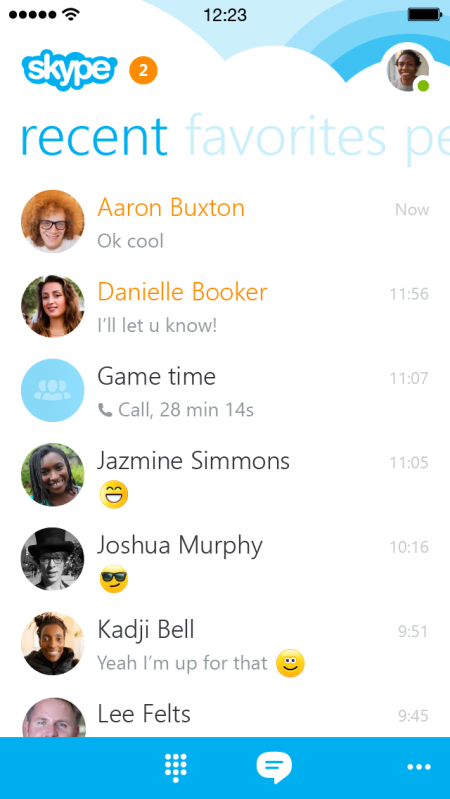 Skype is getting a refresh with a new user interface and a bunch of new animations. Developers is hard at work to make this the speediest version “5 times faster” than its present version. You can expect smooth scrolling and transitioning when you swipe from your conversations to your favorites, up to your contact lists. All elements are geared up with better performance and battery improvements for an optimum user experience. You can start group chats easily from the hub and notifications were also enhanced significantly in this revamp. There will be in-app notification banners where you can view new messages without leaving your chat window. An improved read/unread notification sync feature between multiple devices is also coming its way. This means that the messages that you read on your iPhone will also be marked as "read" on your other devices. Photo-sharing is a lot easier with the file picker inside the chat window. You can send message and photos to your fiends even when they are offline. There will also be a Favorite Tab which shows people whom you frequently have conversation with. These and more exciting features are heading their way next week on iPhone. Likewise, iPad is also reported to have a similar update in the coming weeks.